The concrete exterior of this home, situated on a lava flow in Hawaii, was inspired by the surrounding landscape. 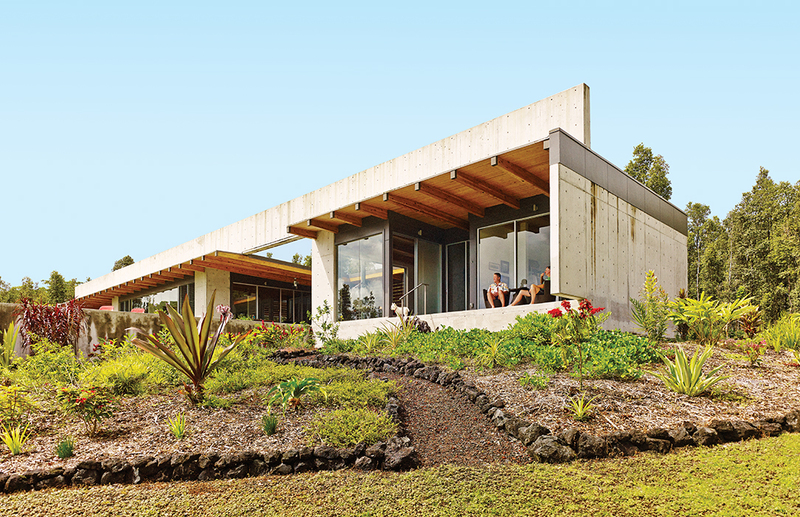 “Like the ohia, the gray concrete house would blend into the existing landscape of lava and trees, while splashes of color in the house would mimic the lehua,” says architect Craig Steely of his idea to use the material. A concrete-block wall lines the interior of this renovated midcentury home in Napa, California, adding texture that contrasts the angled wood ceiling. Both indoors and outdoors, this modern family home in La Jolla, California is composed primarily of concrete, stainless steel, and wood, creating a seamless transition from the kitchen to the patio. Cor-Ten steel and board-form concrete give the exterior of this Sea Ranch, California home a weathered look. Concrete walls and other accent pieces puncture the interior of this sunny home in El Salvador. This green home in Carmel, California features site-poured concrete walls. “The rough texture of the concrete helps tie the house to this dynamic and wild setting," architect Jonathan Feldman says. Inspired by the concrete houses of his former mentor, Tadao Ando, architect Koji Tsutsui designed a home for a friend in Tokyo that resembles a series of concrete boxes.